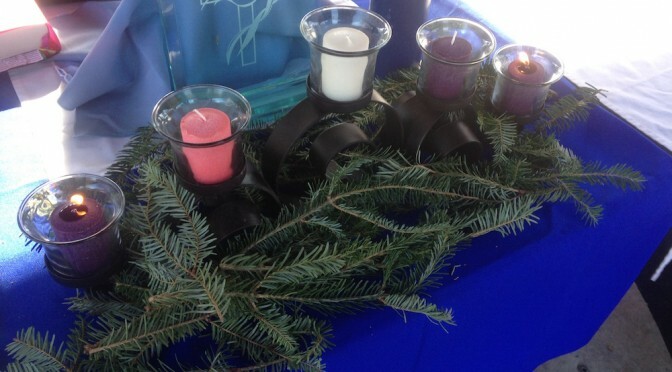 Voice: Last Sunday we lit the first candle in our Advent wreath, the candle of hope. We light it again as we remember that Christ will come again to fulfill all of God’s promises to us. A person lights the candle of hope. Voice: The second candle of Advent is the Candle of Peace. It is sometimes called the Bethlehem Candle to remind us of the place in which preparations were made to receive and cradle the Christ child. Voice: Peace is a gift that we must be prepared for. God gives us the gift of peace when we turn to God in faith. Voice: The prophet Isaiah calls Christ “the Prince of Peace.” Through John the Baptist and all the other prophets, God asks us to prepare our hearts so that He may come in. Voice: Our hope is in God, and in God’s son Jesus Christ. Our peace is found in Him. We light this candle today to remind us that He brings peace to all who trust in Him. Voice: Let us pray. Loving God, thank you for the peace you give us through Jesus. Help us prepare our hearts to receive Him. Bless our worship. Guide us in all that we say and do. We ask it in the name of the One born in Bethlehem. Amen.